This painting has a ways to go yet, but I wanted to show you what I’ve been working on. My daughter is a fabulous baker, and this is her chocolate cupcake with cream cheese frosting that is her latest creation all from scratch. Right now it looks like it’s a plate flying in the area with a blob on top, I know! The background reflections are partly in, and I have to add the tabletop and work on forming the beautiful frosting, but it’s getting there. Which ones do you find more successful? Two plus one. 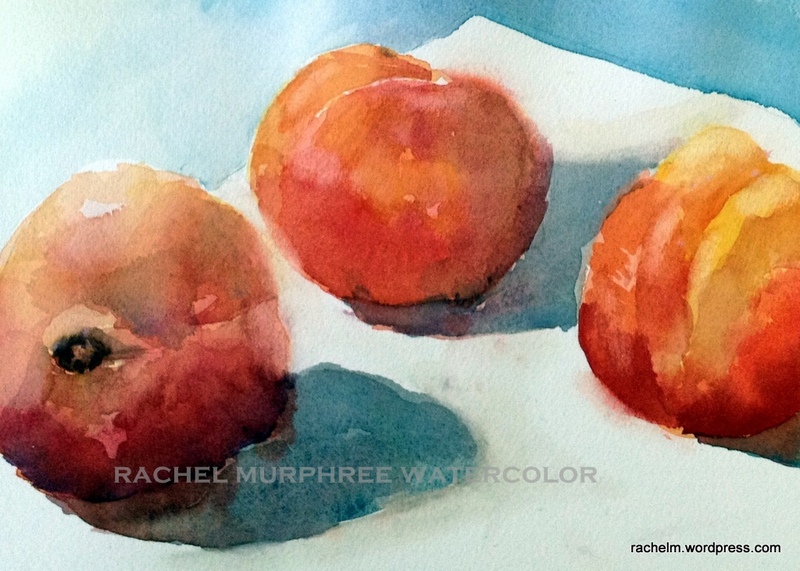 Two peaches and one nectarine.8 x 10 watercolor. $25. Today’s offering is summer fruit, specifically two peaches and one nectarine. 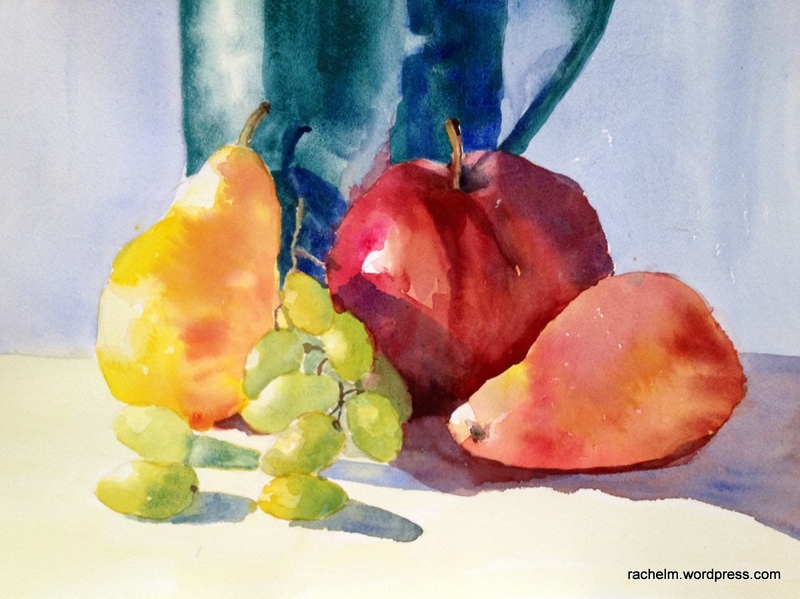 My goal was to show the texture and difference between the fruit. Can you tell which is which? I will post this near the bottom. This painting was wet in wet in layers, letting the paper dry between. I don’t think I was patient enough in the layers and have lots of bleeding that I didn’t intend, which changed the shape of the one on the left in particular, but again, live and learn! that’s why I’m doing the daily painting challenge. The nectarine is on the far right. I painted it with sharper edges to make its surface appear shinier. did it work? after all, painting is taking 2D and tricking the eye to be 3D with texture, light, form and shadow… it’s a very fun journey…glad you’re along for the ride…. 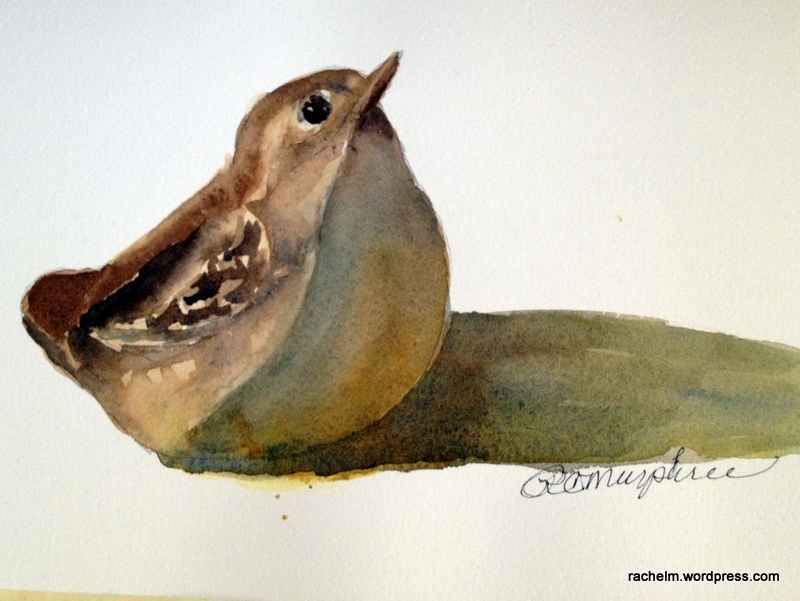 This is another watercolor that will be framed and available for sale at the El Paso Art Association show on Friday August 28, 2015 at 509 W. Paisano. Draw often. I mean often! I heard an interview with portait artist Laurel Boeck who worked with a master painter after art school, when she realized she hadn’t learned the nuts and bolts of the art practice, and for the first year with him she drew — she never picked up a brush! Can you imagine? The interview is part of the Artists Helping Artists podcast which I highly recommend. Do value sketches with paint in three values with one color. Take a color such as the traditional ones of sepia or ultramarine or be sure to use a pigment that will paint light, medium, and very dark. Those are the three values you need as a base to make a successful painting. Some pigments such as yellows won’t go dark enough. Squint at what you are painting and just how in low light such as dusk, you see some lights and some darks and a lot of medium values that all look similar, the same occurs when squinting. The different medium values all look the same and that makes painting simpler if you can merge all those medium valued shapes into connecting shapes. The lights and darks correctly placed will render the object or scene believable so you can see if the painting composition will work. These tips serve as reminders to me to do them more and often. I hope they help you too! No, not EScapes, but scapes. Have you heard of them? I hadn’t until visiting a farmer’s market recently and picking up these curvy stems of the garlic plant that just make me smile! You can chop them up into salads (very strong) or saute them as a milder garlic taste. And when their heads pop open with a bit of the flower beginning — see the bulge to the left of the pepper — it’s enchanting. Knowing I wouldn’t be able to do these in life before they wilted and dried, I decided to pose some still lifes, with the light source to the left. For “fun” I added the kale bunch, and that’s proving to be QUITE the challenge to paint! I thought I’d share a bit of the process with you on how I go from a photo to starting the painting. I first make a small sketch with values to understand the shapes, curves, shadows and other elements that will make the objects recognizable. This was in my sketch book. 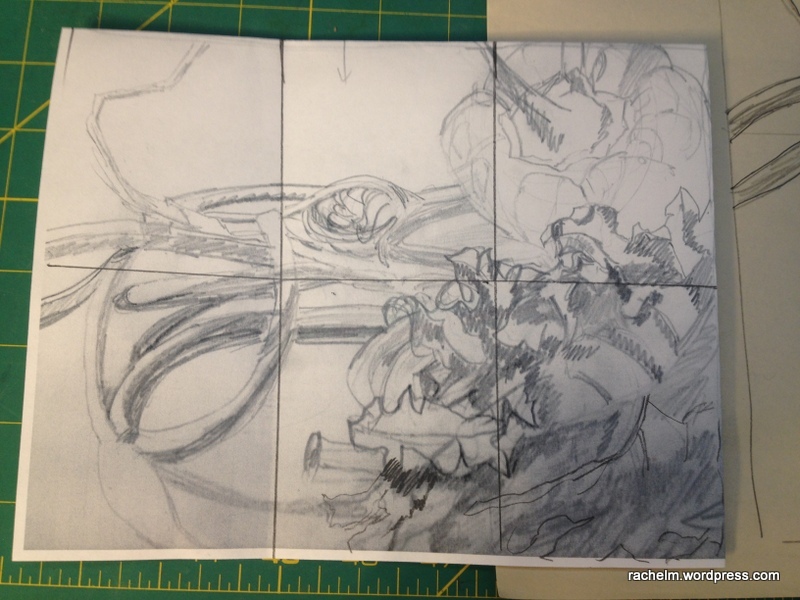 I added the grid on top later, in order to enlarge the drawing to fit the selected paper size, in this case 11″ x 15″ (or what is called a “quarter sheet” of watercolor paper, that has traditionally been made in sheets that are 22″ x 30″. By making the grid and putting in a grid on the larger paper, it’s a matter of transferring lines from one square to a larger one, by seeing where the drawing of the left bulge of the pepper, for example, intersects the grid lines in the smaller version and making it fit a similar dimension in the larger grid opening. 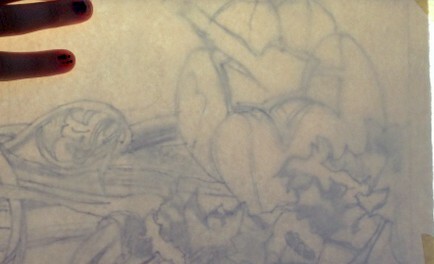 portion of enlarged sketch on the lightbox to transfer to watercolor paper. While I’m doing this I’m not restricted to how I drew it originally but because I’m understanding it better, I can omit some lines, make less but cleaner shapes, connect shapes of certain values together to make other more interesting shapes, etc. This is an ongoing learning process for me on how to do that, and I perhaps didn’t do it enough. 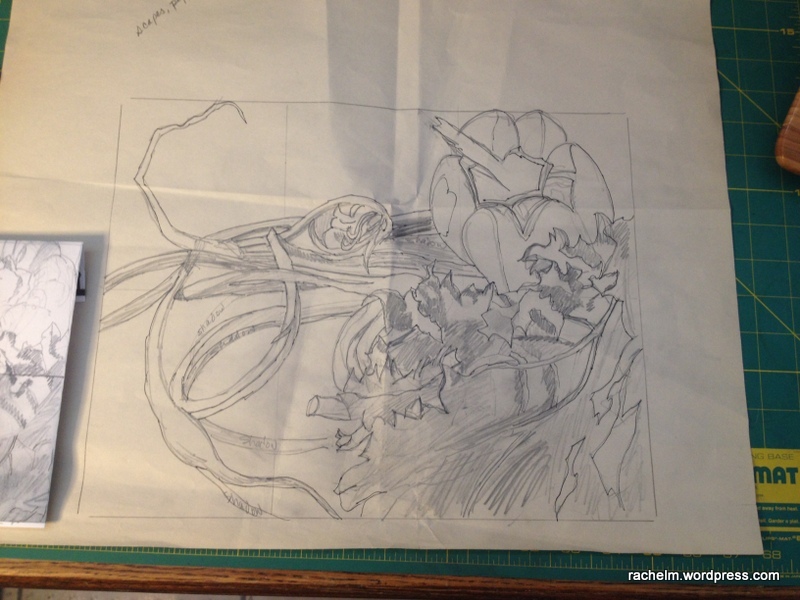 Then I trace the major lines with a darker pen or maker in order to see them more clearly when I place them on my light box and put the thicker watercolor paper on top to trace the image with a mechanical pencil onto the paper. here’s a snippet of how that looks. And now the fun part, to start painting! Here’s the first pass of building up color on the pepper and the scapes and putting in lights for the kale. I’m using hansa yellow and clear water for the highlights with warm reds (pyrrol orange and pyrrol scarlet) with a neutral Quinacridone red for the areas of each bulge that are facing the light. I use cooler reds for the sides away from the light (permanent rose, quinacridone magenta). I do each bulge (there must be a more precise word for these?) individually, charging them wet into wet to mingle the colors and the hard edges that form help separate one bulge from its neighbor. Yellows glow through colors layered on top of them, such as blues or greens in this case, so we want the glow of the warm greens to contrast with the color blue greens and shadows in the kale leaves. 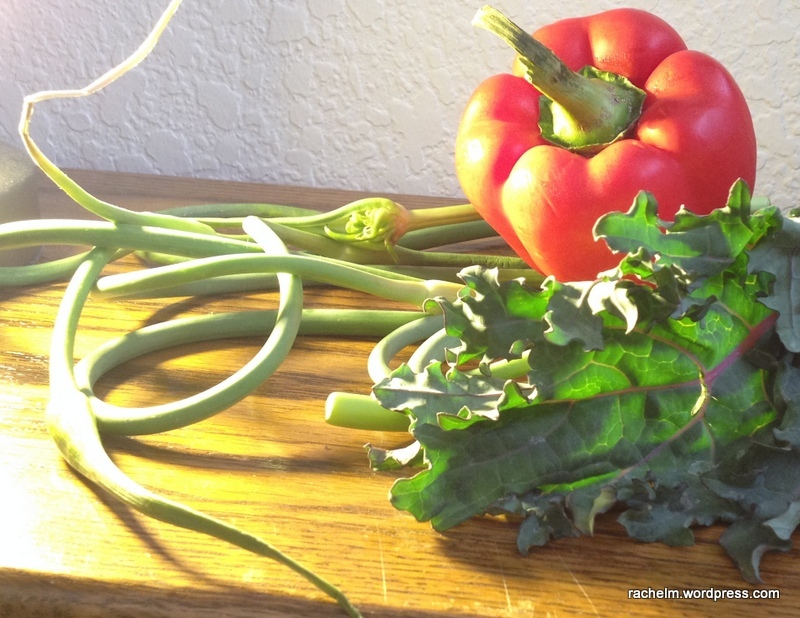 Stay tuned because I’ve done more work on this that I’ll talk about in the next post, on how I got “lost” in the kale leaves and found my way out! Thanks for stopping by. If you’d like to leave me a comment, I’d love to read it! Asparagus: Which would you choose? 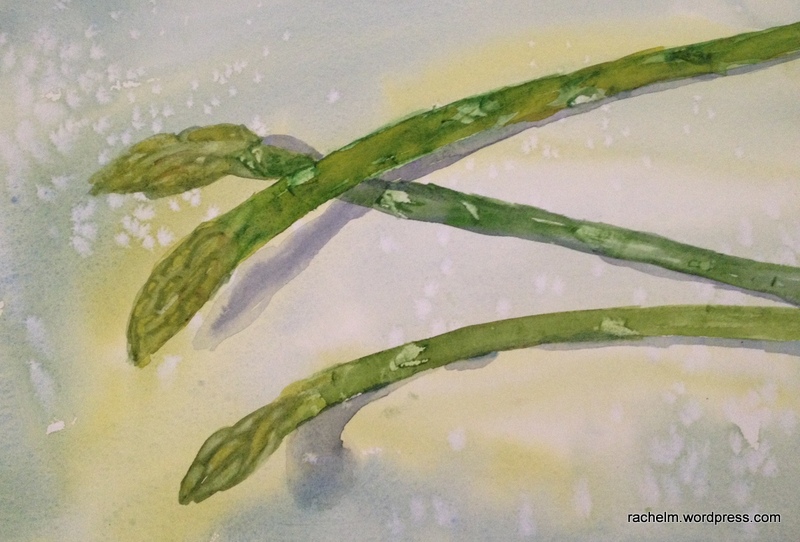 Wet in wet painting of asparagus. 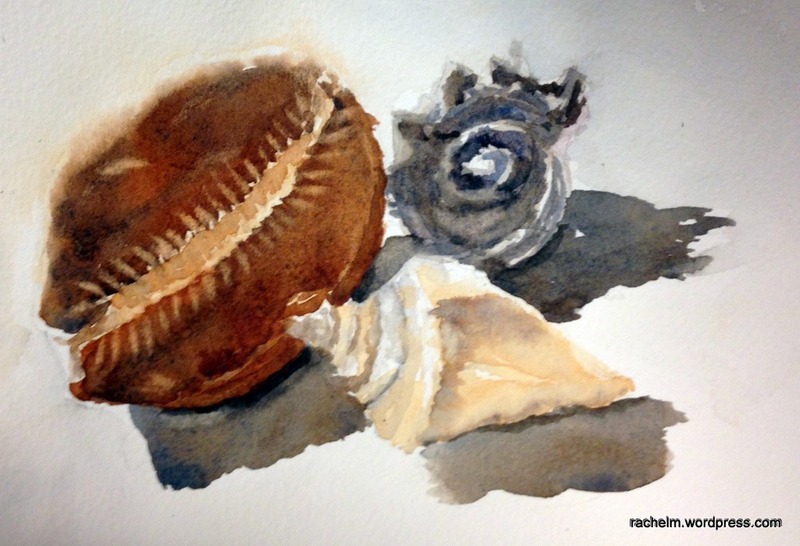 Watercolor 4″ x 11″. Available. Click on image to view larger. After doing some studies on painting asparagus, yesterday the work came together in these two rather different pieces. Both have wet in wet elements, but have different feels. Do you have a preference? I’ve polled my household, and so far there’s one vote for each. The upper one is a wet in wet background, made by wetting the paper with water and when it’s settled in, stroking on blues and yellows and then sprinkling some salt on it while wet. That’s what makes the sparkly areas. 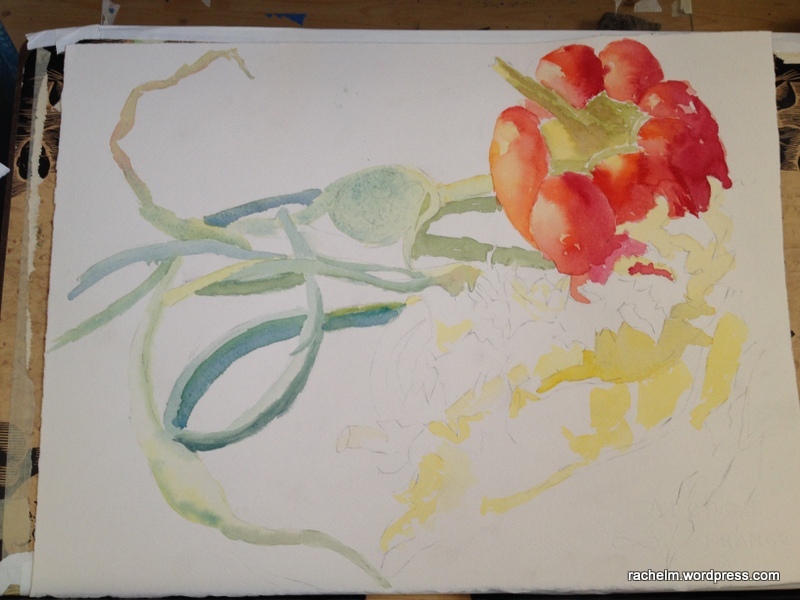 After that I painted in the spears letting the various greens merge and then scraped aside the areas of the tips and along the stem, and then went back in and lifted some color using a damp brush to model the shapes more. The second one is completely wet in wet. Paper wet, colors in and then using thicker and thicker puddles of pigment I build up the shapes of the spears, did some scraping, and then some painting when it was dry. Little wren porcelain sculpture. Click on image to view it larger. Available. This little wren is one of my favorite pieces and it was a lot of fun to get the shape and beak just right on this little guy. They are the perkiest little birds, such fun to watch flit around. too bad we don’t have them around here as much as in other places. 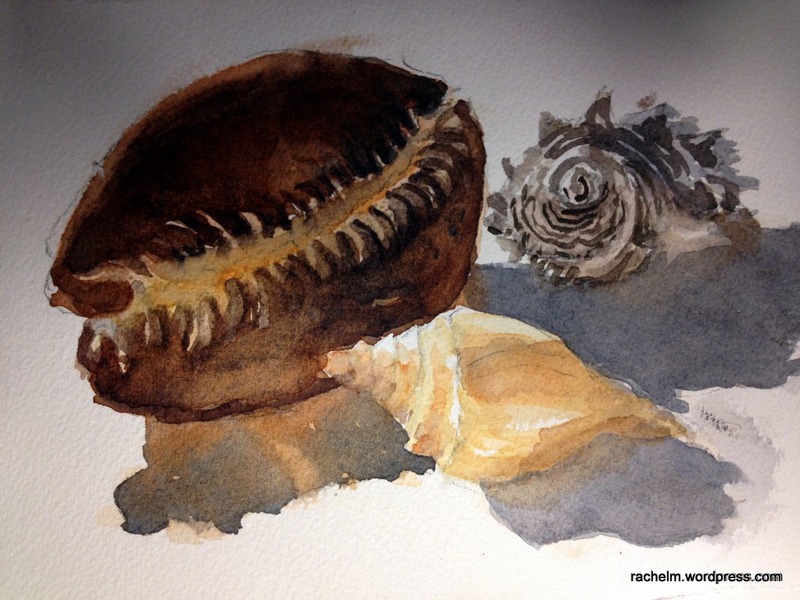 So this is day #14 of the 30 paintings in 30 days challenge, and how knows? this weekend may be the time I “catch up” although it’s not really a requirement. 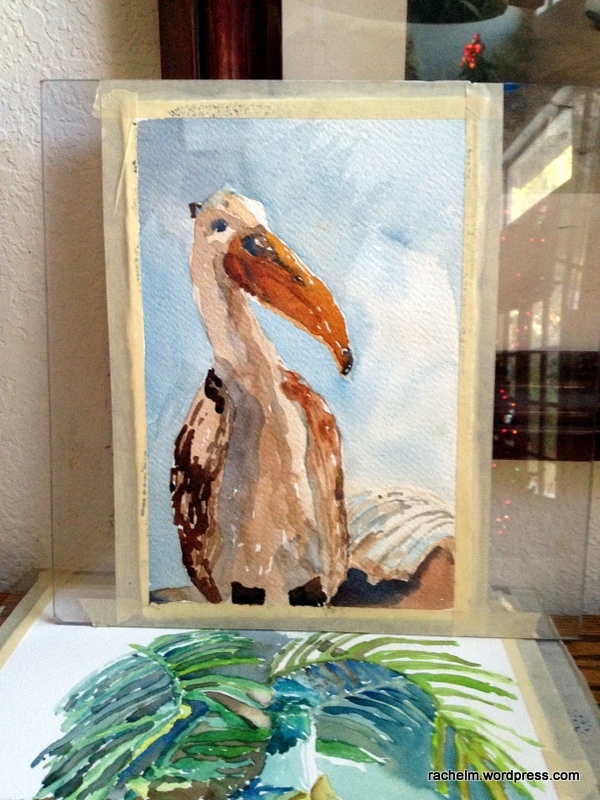 Pelicans, fronds, and more. Paintings from first group lesson. Click on image to enlarge. Yesterday I went to my first meeting of a small transparent watercolor group that invites local teachers to come in. In my very limited workshop experience I’ve found that I learn a lot but don’t produce anything worth showing, but this time was different. I was inspired by the pelican figurine and again it’s in my favorite colors of oranges and blues. The fronds painting lying down was much more intimidating for me, so much going on with a wine bottle in front, fronds, ivy leaves, some fruit there too, and I found the pace very fast…but perhaps because of the extra stress of being in a workshop, but that was also VERY enlightening because it brought home yet again, don’t make it “precious” don’t think it has to be perfect, just get in there with the juicy paints, try to see the darks and lights and get those down. My fronds started looking much better once I got some darks in amongst them. It isn’t done and won’t be done, but it was a great experience. We started out doing contour drawing which is difficult but I found freeing because the sketch does not have to look like what you’re drawing. It is when you follow the shape and shadows of the object with your eye while slowly moving your pencil without looking at your paper. The goal is to sync the two movements (eye and pencil) so that you are measuring the distances on the object you need to make it look realistic. So you learn an awful lot about the subject you are drawing, but without fretting over making the sketch “look good”. Does that make sense? The teacher commented on how the sketchy kind of marks you make with contour, or partial contour (when you look at your paper frequently) can give a life to your sketch/painting that wouldn’t be there otherwise. All in all, a wonderful afternoon, I came home on such a high. I am really grateful to have found this group and look forward to next week when we have a drawing instructor coming in. Luscious fruit posed in front of a favorite pitcher with a strong light on it for cool shadow potential. My favorites are the grapes. and my least favorite is the apple. How about you? I read somewhere recently that the best thing to do is ask friends for what parts of the painting jump out at them as not seeming right, not participating in the full dimensional effect that we want in a painting. So C and C are always welcome! what doesn’t work for you? Kabocha squash, onion and red bell pepper. 8″ x 12″. A good lesson on stopping sooner. I liked it better without the spatters in the background. Keep current on what’s going on in my art world through monthly or bimonthly emails. I’ll let you know where you can see my art, what shows I will be in, and other art related news. I definitely won’t bombard you with mail.. Thanks!